No dentist wants to tell a patient they are going to lose a tooth. But while your teeth were designed to last a lifetime, they sometimes don’t. Replacing missing teeth is important to your dental and general health. The good news is that A Supa Smiles offers several good replacement options, including dental implants. If a tooth does need to be replaced, there are generally three options: dentures, bridges, and permanent implants. Permanent implants are artificial teeth, surgically inserted into the bone where a missing tooth was. It is usually a titanium alloy screw that substitutes for a tooth root. 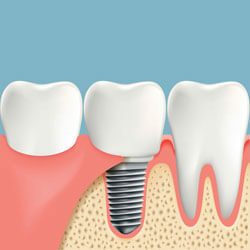 A dental crown is fitted on top of the implant to complete the procedure. Together they form a complete replacement tooth with almost the exact characteristics of the original tooth. Improved appearance. Dental implants look and feel like your own teeth. And because they are designed to fuse with bone, they become permanent. They bring back your smile! Improved speech. Dental implants allow you to speak without the worry that dentures might slip, or gaps might lead to strange sounds. Improved convenience and comfort. Because they become part of you, implants eliminate the discomfort of removable dentures. Improve your appearance. Dental implants preserve bone, improving your smile and preventing deterioration of the facial structure. The overall look of your smile and face is improved. Improved self-esteem. Dental implants can give you back your smile and help you feel better about yourself. They also allow you to chew normally, giving more confidence when eating in public. Improved oral health. Dental implants don’t require reducing other teeth. More of your own teeth are left intact, improving long-term oral health. Individual implants also allow easier access between teeth, improving oral hygiene. Why is A Supa Smiles the Right Dentist for your Dental Implants? Because you may not need implants! Our first focus is on keeping your natural teeth. In those cases where it is not possible or advisable to save a tooth, we evaluate your situation and help you determine if dental implants are right for you. Determining if you are a good candidate for dental implants includes a painstaking visual examination, X-rays, and in some cases iCat 3D imaging. If you have the bone density and periodontal health necessary for a successful procedure, we can proceed. If not, it can still be possible to get implants by supplementing bone mass and gum tissue through grafting procedures. At A Supa Smiles we perform bone and periodontal grafts in the convenience of our office. After these procedures, time to let bone and/or gums heal properly is necessary before implantation. Installing dental implants requires precise angled drilling of “tap holes” that prepare the bone for implantation. Drill speed must be carefully controlled to prevent the bone overheating. If the bone gets too hot, osseointegration (implant bone-bonding) can be impaired and the implant may be rejected. A Supa Smile uses cutting edge equipment to perform these procedures. We have the finest surgical drills, sterile drapes, and sterile attire to ensure you the safest and most efficient treatment possible. Our staff is also trained in the most modern implantation techniques. In some cases, it is possible to do the entire procedure in one visit. At A Supa Smiles we prefer to spread the process across time. We want to be certain that the osseointegration happens properly and without complications. While a slow and steady approach is our first choice, we always try to work with the specific needs of our patients on a case-by-case basis. Contact us today on (03) 9723 0703 or book your appointment online to claim this amazing offer!